I have held off as long as I could but I think we better talk about this now before it goes any further. Tim Tebow is a phenomenon is the media these days. His Denver Broncos football team is on a 6 game winning streak and he is 7-1 as their starting Quaterback. Despite his apparent limitations (skills) he has orchestrated a series of amazing comebacks during the winning streak. That is a big deal! Any fan would love to have their team on this kind of a roller coaster – come from behind – frenzy. That, however, is not what makes this news. “Tebow came to me and said, ‘Don’t worry about a thing,’ because God has spoken to him,” Woodyard told The Denver Post this week. It was Woodyard who then stripped Bears running back Marion Barber to hand the football — and the game — back to Denver. For Tebow, just another day at the office. I want to be clear this before I say anything else: I am not hating Tebow. In fact, I like him. I like how he uses his summers to serve needy people in other countries. I like that he works so hard. I like that he is unorthodox in his throwing motion and scrabbling technique. I like that he is so sincere and transparent about his faith. Some people get upset that he is always cramming his faith in their face. That is not what concerns me. It is his brand of faith that concerns me. I have been very forthright that A) this is the camp of evangelical-charismatic zeal that I was raised in and emerged from B) that the epistemology behind ‘hearing from God’ … and the interventionist assumptions behind a ‘super’ natural worldview are antiquated relics of a pre-modern understanding and are untenable in the 21st century. If you want a more nuanced explanation, listen to “Pentecost for Progressives” [here] – starting in minute 55 OR read the summary [here]. This is the season of Advent and we do tell the story of God speaking to Mary. That is not what I am contesting. Are you under the impression that God cares who wins a football game and intervenes to bring it about but doesn’t care enough about the thousands of children who are starving to do something about it? Are you telling me that god knows but doesn’t care, or that God cares but doesn’t know, or that god could do something but won’t or that god would do something but can’t? Look, I am not an either-or guy. I hate binaries, dualisms, and us vs. them mentalities. But when someone says that this is how God is… sometimes it forces you to say that I believe this God to be a false creation of human imagination – nothing more than an athropomophic projection. I could be wrong. He keeps winning and people say ‘If Joel Osteen wasn’t doing something right, he wouldn’t have 37,000 people who go to his church.” In America, success = correct. The Calvinists could be right. God chooses whom ‘He’ wants to. I don’t want to be one of those people who say “If God is not the way I believe they-she-he is, the I am not going to worship them-her-him.” I will worship God no matter what way God turns out to be… but I happen to really like the Jesus of the 4 canonical gospels… just sayin’. Tim Tebow himself has hinted in the past that he does not believe in an interventionist god. Bob Costas alluded to this to in his amazing speech. 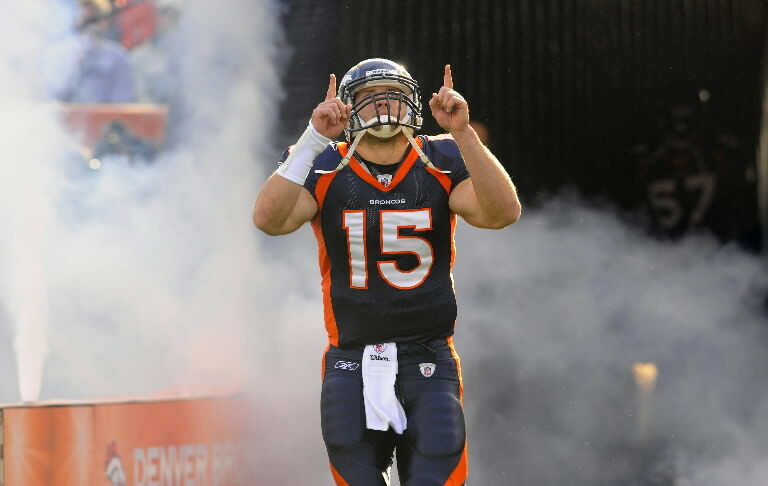 It’s not Tebow that concern me – its Tebow’s fans.